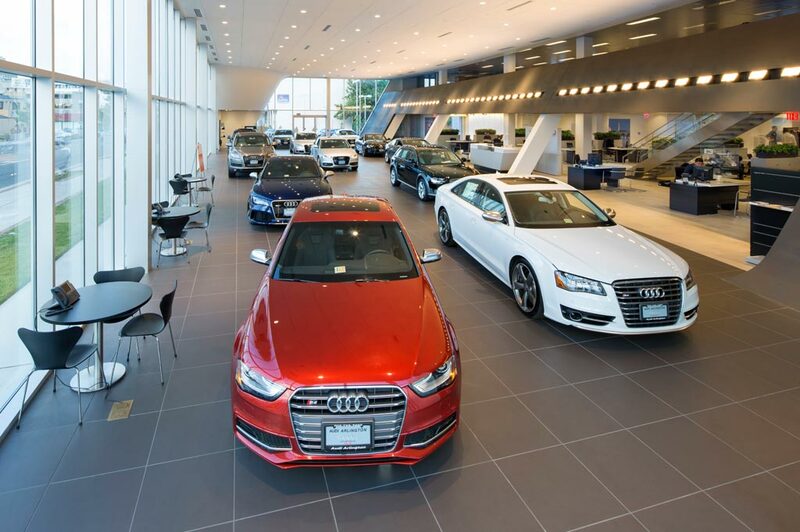 Audi West County in Ellisville, MO treats the needs of each individual customer with paramount concern. We know that you have high expectations, and as a car dealer we enjoy the challenge of meeting and exceeding those standards each and every time. Allow us to demonstrate our commitment to excellence! Our experienced sales staff is eager to share its knowledge and enthusiasm with you. We encourage you to browse our online inventory, schedule a test drive and investigate financing options. You can also request more information about a vehicle using our online form or by calling (636) 391-7228. Bommarito Audi West County in Ellisville, MO treats the needs of each individual customer with paramount concern. We know that you have high expectations, and as a car dealer we enjoy the challenge of meeting and exceeding those standards each and every time. Allow us to demonstrate our commitment to excellence! Our experienced sales staff is eager to share its knowledge and enthusiasm with you. We encourage you to browse our online inventory, schedule a test drive and investigate financing options. You can also request more information about a vehicle using our online form or by calling (888) 378-2595. Those in search of a new Audi vehicle in Ellisville, Ballwin, Saint Louis, and Saint Peters don't need to look any further. Here at our dealership, we have a wide selection of vehicles to choose from, and a team of specialists who have the knowledge and expertise to assist you throughout your car buying experience. New car smell is great, and we've got a range of new 2018-2019 Audi vehicles that will delight your senses. But we think feel is really where it's at when you're dealing with a new Audi A3, Q5, Q7, A3 or A4 model. That's why the Audi West County sales staff is here to point you in the right direction and to assist you with the next step. After all, once you find Audi that looks right to you, you're going to want to get behind the wheel to see if you get that new car spark. Beyond simply selling new cars, our dealership is also known for giving Audi models a second chance on the road by carrying an excellent selection of used cars as well. Each vehicle we receive from a previous owner is thoroughly inspected to make sure it's fit to be driven in Ellisville and the surrounding Ballwin, Saint Louis, and Saint Peters areas, meaning you can count on a reliable vehicle when you shop at Audi West County. Can't wait to take your new Audi vehicle home? Our friendly staff is well-versed in helping drivers of all financial abilities discover the best car loan and lease options available. Whether you're a first time car-buyer, or you have years of experience under your belt, Audi West County can help all Ballwin, Saint Louis, and Saint Peters drivers achieve the ideal auto financing options. That means you can focus about what's really important: that shiny new or pre-owned vehicle. Once you are the proud owner of a Audi model, Audi West County wants to help you keep that new car as safe, efficient, and well maintained as possible. Our factory trained staff are pleased to provide you with onsite car service and repair. We utilize the latest automotive car care technology, and exclusively use only official Audi parts for any vehicle repair, or upgrade. Audi West County proudly serves drivers in Ballwin, Saint Louis, and Saint Peters with all of their automotive needs. Whether a new or used car is in order or a little maintenance is required, visit us at 15736 Manchester Road Ellisville, Missouri and we'd be happy to help you, too.